Welcome to our “Large Kribs” Page. Some cats just need the mansion for playing and relaxing. Our “Large Krib” designs for your cat have many options from floor to roof top. 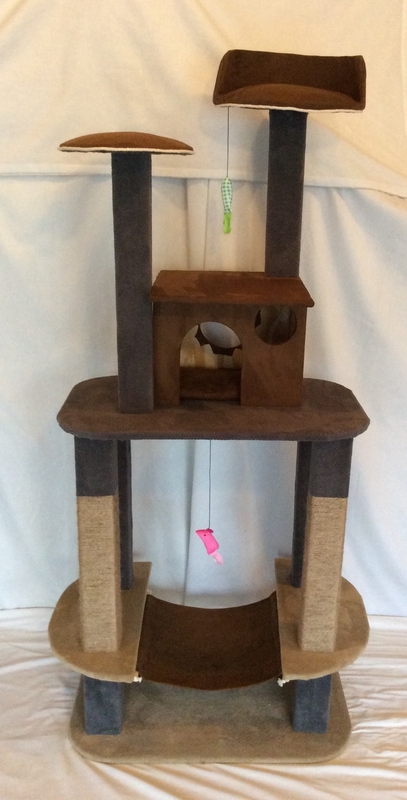 All our “Large Kribs” have everything your cat needs and more; including a soft comfortable structure, scratch board or poles, toys, beds, hideouts, houses with pillows and last but not least different size and shaped pedestals or lofts to relax on. Our “Large Kribs” can be all one color or a color combinations with a variety of solids and prints. These mansions are the true playground for any cat. Multiple cats can play at the same time and not get in each others way. They will spend plenty of time playing and resting on their “Large Krib”. Our “Large Kribs” range from 5+ feet high. The average price is $300 depending on the detail. All our Kribs are built one by one with tender loving care to make sure your beloved cat is safe and secure.